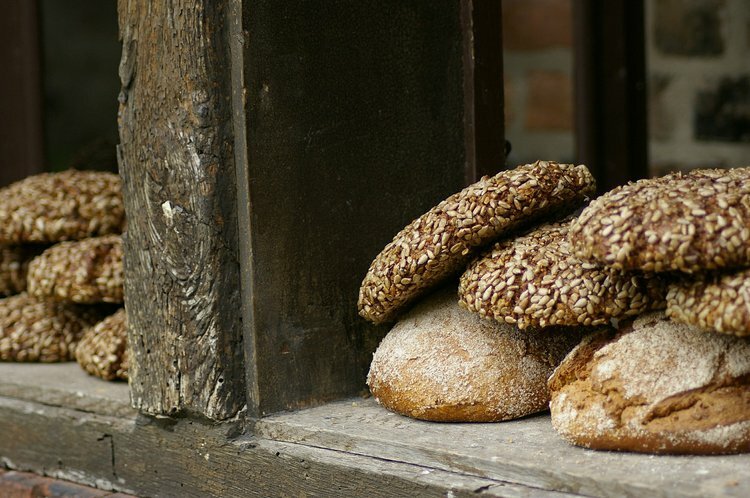 Why Are Whole Grains Healthier Than White Bread? Studies have found that whole grains provide more potential health benefits than refined grains and are associated with reducing the risk of coronary artery disease, stroke, mortality, and atherosclerosis. There seems to be a perpetual debate on the topic of whole grains, as individuals are wondering just how much healthier are whole grains than refined grains. Extensive research has been directed to identify if the perks of whole grains are beneficial enough to trade in the delicious white bread for the whole grain version. These studies are conclusive in their findings that whole grains provide more potential health benefits than refined grains and may be associated with reducing the risk of coronary artery disease, stroke, mortality, and atherosclerosis. Knowing the physical differences between whole grains and refined grains can help you gain a better understanding of how they influence our health. According to the Whole Grains Council, whole grains are made from all of the crucial parts and naturally occurring nutrients of the full grain seed in their original quantities. In order for a grain to be qualified as a whole grain, it can be intact, ground, cracked, or flaked fruit of the grain, but must contain the original amount of the 3 principal constituents of the grain, which are bran, germ, and endosperm. Some common examples include barley, buckwheat, corn, oats, quinoa, rice, rye, and wheat. When whole grains are refined into white flour, the outer bran and inner germ layers are detached and the remaining endosperm is processed into flour. In comparison with refined grains, whole grains are naturally richer in dietary fiber, amounting to about 80% more dietary fiber than refined grains. During the refining process, there is a substantial loss of crucial vitamins, minerals, and phytonutrients. These refined grain foods are generally energy rich and nutrient poor, which may consequently heighten the risk of atherosclerosis. There is consistent evidence from research that whole grain foods significantly lower the risk of chronic conditions such as coronary artery disease, diabetes, and cancer. These studies also exhibit a role for whole grains in the management of body weight and digestive health. The University of Minnesota School of Public Health published a study in 2003 showing that over an 11-year period, the intake of whole-grain foods was inversely associated with total mortality and incidence of coronary artery disease for Caucasians and African Americans. Intake of refined grains was found to be positively related to the incidence of coronary artery disease in African Americans, but not in Caucasians. The risk of all-cause mortality was 23% lower in those participants who reported the highest amount of whole-grain intake. Participants with the highest intake of refined grains in the study had a 34% higher risk of total mortality and 54% higher risk of coronary artery disease, compared to those who reported the lowest intake of refined grains. A Tufts University study in 2002 in Massachusetts, along with a 2007 study at the Boston University School of Medicine in Massachusetts, revealed evidence for an inverse association between whole grain intake and BMI, waist to hip ratio, and waist circumference. In essence, the higher the whole grain intake of participants, the lower their body mass index measurement and waist to hip ratio, and the smaller their waist circumference. A Newcastle University study in the United Kingdom released a review in 2010 of several health-based studies regarding whole grain intake. The evaluation of several studies consistently demonstrated the association between the consumption of whole grains and the reduced risk of cardiovascular disease. Higher whole grain intake has been correlated with a decreased risk of hypertension, or high blood pressure. Research at the Brigham and Women’s Hospital in Boston, Massachusetts, revealed in 2007 that higher whole grain consumption was related to a lessened risk of hypertension in middle-aged and older women. A later study at the same hospital at the Harvard Medical School exposed evidence in 2009 that demonstrate an inverse association between intake of whole grains and incidence of hypertension in men. In other words, the more whole grains consumed, the lower the incidence of high blood pressure. In 2002, the Harvard School of Medicine found that an increased intake of whole grains substantially lowered the risk for type 2 diabetes, in comparison with subjects who had the lowest reported intake of whole grains. Several studies have suggested that the nutrients found in whole grains, as well as the structure of the grains, contribute to this lessened risk. Whole grains contain dietary magnesium and antioxidants like vitamin E, selenium, and phytic acid. This extensive research is in support of the US Dietary Guidelines for Americans. These guidelines suggest choosing a variety of whole grain foods daily, especially products with whole grains. Therefore, start by taking small measures to replace white bread with whole grain bread or whole wheat bread during meals or snacks. Aim for breads that contain 100% whole grains in their labels, or select those marketed as “sprouted” grains. Ingredients such as barley, buckwheat, corn, oats, quinoa, rice, rye, and wheat include whole grains. Making a simple change from white bread to whole grain bread can have a substantial impact on your health, based upon these noteworthy studies. You might not want to sacrifice the taste initially, but evaluating the benefits of whole grains more than justifies the necessity to make the switch. Talk to a nutrition expert about simple steps in which you can make this change, as he or she can recommend measures that would be right for you. Jonnalagadda SS, Harnack L, Liu RH, McKeown N, Seal C, Liu S, Fahey GC. Putting the Whole Grain Puzzle Together: Health Benefits Associated with Whole Grains-Summary of American Society for Nutrition 2010 Satellite Symposium. The Journal of Nutrition. 2011;1011S-1022S. Steffen LM, Jacobs Jr DR, Stevens J, Shahar E, Carithers T, Folsom AR. Associations of whole-grain, refined-grain and fruit and vegetable consumption with risks of all-cause mortality and incident coronary artery disease and ischemic stroke: the Atherosclerosis Risk in Communities (ARIC) Study. American Journal of Clinical Nutrition. 2003;78:383-90. McKeown NM, Meigs JB, Liu S, Wilson PW, Jacques PF. Whole-grain intake is favorably associated with metabolic risk factors for type 2 diabetes and cardiovascular disease in the Framingham Offspring Study. Am J Clin Nutr. 2002;76(2):390-8. Flint AJ, Hu FB, Glynn RJ, Jensen MK, Franz M, Sampson L, Rimm EB. Whole grains and incident hypertension in men. Am J Clin Nutr. 2009;90(3):493-8. Wang L, Gaziano JM, Liu S, Manson JE, Buring JE, Sesso HD. Whole- and refined-grain intakes and the risk of hypertension in women. Am J Clin Nutr. 2007;86(2):472-9. Seal CJ, Brownlee IA. Whole Grains and Health, Evidence from Observational and Intervention Studies. Cereal Chemistry. 2010;87(2):167-174. Liu S. Intake of refined carbohydrates and whole grain foods in relation to risk of type 2 diabetes mellitus and coronary heart disease. J Am Coll Nutr. 2002;21(4):298-306. Slavin, J. (2003). Why whole grains are protective: biological mechanisms. Proceedings of the Nutrition Society, 62(01), 129-134. Slavin, J. (2004). Whole grains and human health. Nutrition research reviews, 17(01), 99-110. Montonen, J., Knekt, P., Järvinen, R., Aromaa, A., & Reunanen, A. (2003). Whole-grain and fiber intake and the incidence of type 2 diabetes. The American journal of clinical nutrition, 77(3), 622-629. Cleveland, L. E., Moshfegh, A. J., Albertson, A. M., & Goldman, J. D. (2000). Dietary intake of whole grains. Journal of the American College of Nutrition, 19(sup3), 331S-338S.